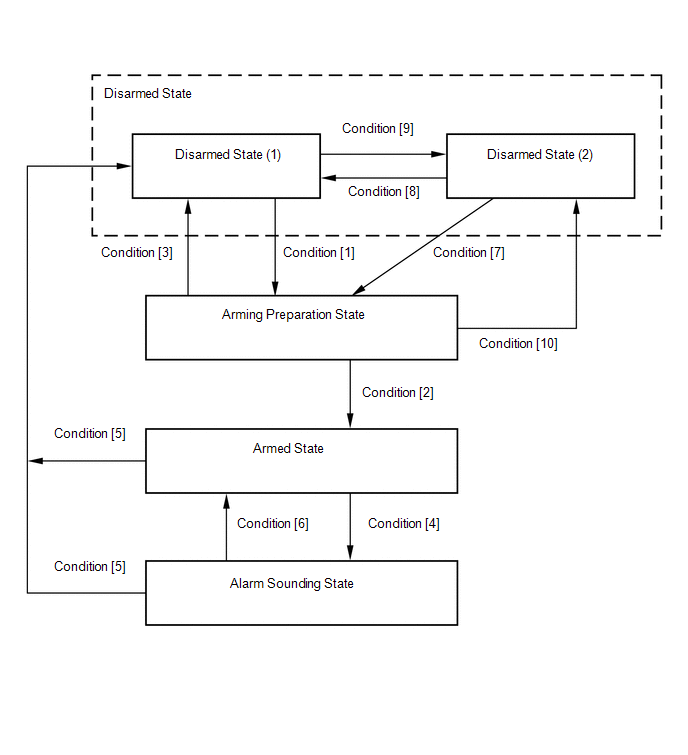 If any of the doors are unlocked when the key is not in the actuation area during the armed state, a forced door lock signal will be output (refer to Forced Door Lock Control). Come on when theft deterrent system has entered alarm sounding state. With all doors and engine hood closed, all doors are locked by wireless operation or smart key system. All doors are unlocked by wireless operation or smart key system. Turn the engine switch from off to on (IG). Turn the engine switch on (IG) when the key is not in the actuation area. Turn the engine switch on (ACC or IG) within 5 seconds after turning it off. Turn the engine switch on (IG) and the engine is running for more than 2 seconds. Turn the engine switch on (ACC or IG). With all doors closed and engine hood opened, all doors are locked by wireless operation or smart key system. 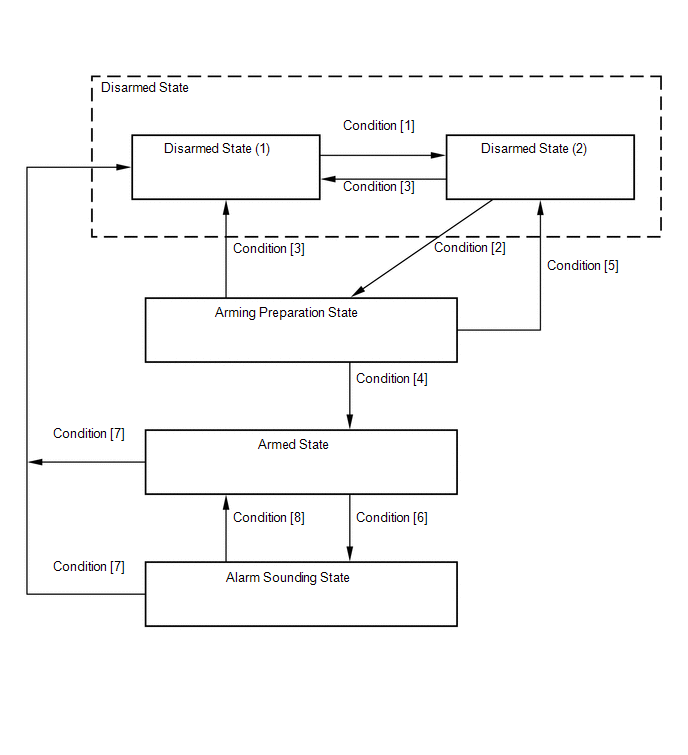 Passive arming mode starts the alarm control after the key is removed from the actuation area and the doors are closed. When the key is not in the actuation area, any door is opened and then the engine switch is turned off. When the key is not in the actuation area, the engine switch is turned off and then any door is opened. The engine switch is turned on (IG or ACC). When 5 seconds or more have elapsed after the engine switch is turned off, the engine switch is turned on (IG). The engine switch is turned on (IG) and the engine is running for more than 2 seconds. The engine switch is turned on (IG) within 5 seconds after it is turned off.